Darrelle Revis tore his ACL on September 23, 2012. Seven months later, the Tampa Bay Buccaneers signed him to a conditional yet lucrative, multi-year contract. Over those seven months, Revis spent countless hours rehabbing his knee to prove to fans and more importantly himself that he can become the cornerback he once was: the best in the league. Revis is no spring chicken. He just turned 28 years old. The man who once owned his own island did not play in either of the Buccaneers’ first two preseason games. He is, however, rumored to see some activity in their third, against the Dolphins, ironically against whom he tore his ACL nearly a year ago. Odds are, even then, Revis will be used sparingly. 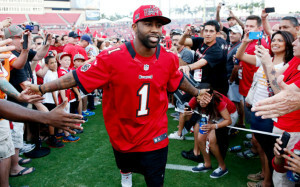 That limited playing time will all change on September 8 when the Buccaneers face off against Revis’ former team in East Rutherford, NJ the first week of the NFL regular season. Revis’ former coach, Rex Ryan, will most assuredly have a game plan to test his former star player’s health. Whether Jets quarterback Mark Sanchez and his questionable receiving corps can carry that game plan through remains to be seen. Revis’ first true test will come when he returns to Tampa Bay to defend against a quarterback who, by the end of the season, will become the 5th leading passer of all-time: Drew Brees. Brees is a considerably better quarterback than Sanchez. Mentioning those two in the same sentence is almost sacrilegious. New Orleans’ wide receivers are also far superior to New York’s. An eight year veteran, Marques Colston has proven to be one of the most dangerous targets in the league, amassing less than 1,000 receiving yards in a season only once. That could be a long Sunday for Darrelle’s knee-vis. While many of us sit and wait, only Revis can determine his own timetable for return. Just like Chicago Bulls’ point guard Derrick Rose, who didn’t play a minute last year, similar pressure mounts for Revis. Brees and company will soon see to it. We don’t yet know how effective Revis will be or if he can become that cornerback of old. That Jets crowd won’t be very welcoming but at least Revis has studied Sanchez’ tendencies in the past and will be defending inferior Jets receivers. When he suits up against Brees and Colston one-on-one, which coach Sean Payton will ensure happens repeatedly, we’ll find out whether the Buccaneers made the right decision to sign him. Of course, one game means very little. Maybe we shouldn’t overreact to a rough start. If Revis returns 100% healthy, all will be glorious in the bay area. But if he’s not, it’ll be back to the drawing board for a secondary that last year was one of the worst in league history. Keep your fingers crossed, Buccaneers fans. We’ll all get to exhale soon. This entry was posted in Featured, Pigskin and tagged Darrelle Revis, Derrick Rose, Drew Brees, Mark Sanchez, Marques Colston, Miami Dolphins, New Orleans Saints, New York Jets, NFL, Rex Ryan, Sean Payton, Tampa Bay Buccaneers by Chris Humpherys. Bookmark the permalink. I am sorry, but why did Mark Dominik offer Darrelle Revis .. . such a large contract ? Are we now seeing the Bucs reverting back to those idiotic years of when Bruce Allen and Jon Gruden were signing any damn idiot that they believed would be of benefit to the Bucs ? After the 2002 Superbowl win what did Gruden achieve that was of merit, much less develop talent for the Bucs` long-term future ? Dominik and Greg Schiano , now look as if they`re leading fans up the Yelow Brick Road to the ultimate destination that might not even be the Land of Oz . The real key to Bucs success this season will be actually predicated upon the play of the following players, Doug Martin , Mike Willliams , Vincent Jackson ,Mark Barron and Gerald McCoy. You will note that I didn`t mention Josh Freeman ? I no longer have any faith in the player, because I simply no longer believe that he is capable of leading this team to any sort of tangible success ! As good as that secondary may or may not be, if the Bucs can’t get pressure on the quarterback the defense is going to have a problem stopping anyone. I read they just signed a defensive end. Why in the hell couldn’t they resign Bennett? The only thing I like about the contract is that it’s not guaranteed. That being said, you’re right. They didn’t have to shell out that kind of cash AND they were the only team out there willing to do so and still couldn’t drive that price down. At this point, all we can do is hope for the best. And hey, at least they showed they’re finally willing to spend some money. Oh wait, there’s a salary floor. They had to. They have individual pieces of success but I want to see if the parts they’ve added add up to a greater sum. I’m still not entirely convinced they will. I don’t have them any better than 8-8 this season which means next season, some hard decisions are going to be need to be made. Just reminds us again how much we miss guys like Sapp and Brooks. NORLNS is the team to watch out for this year. Why? Ego maniac Sean Payton is back at the helm. Their defense is markedly improved with Rob Ryan They should go undefeated at HOME this year. Start counting from 8 on up. Revis? He needs a pro bowl type season to help the Bucs. But come on…..after that serious injury. Is Greg Schiano becoming TBay’s military man similar to Coughlin? Got news Greg, the other guy’s got SuperBowl hardware. For some reason, Bets, I’m a believer in Atlanta this year. I still think they take another step closer. I don’t think they’ll regress. Their over/under is only 9.5 and to me, in what’s probably still an overrated division, I have to take that over. And Revis? I’m sure mine aren’t the only fingers crossed. Stay tuned. My over/under contest will be up and running shortly. Mark Dominik and Greg Schiano may well ave to gut the team in lieu of the free agents in 2014 on the roster . 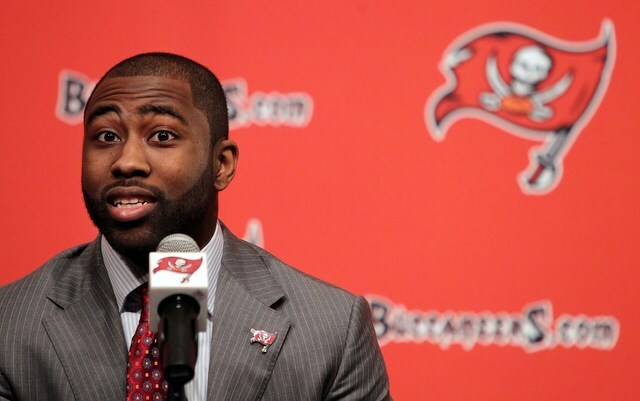 The guaranteed money committed to Darrelle Revis is asinine , but I guess it`s the way the Bucs still do things ! News state that there is no guaranteed money , but it is all in details and how incentives are laid out (roster bonuses, OTA`s and other benefits as long the player meets those it is in essence guaranteed ) . Left you a response on the NFL piece . I`m with you on the Falcons within the NFC South this season ! Ronbets may well be watching something else because that Saints` – defense remains porous and could not stop a diaper rash. While Sean Payton has been the Saints` coach , he simply has not done enough to address the issues on defense . The stats and NFL ranking don`t belie that fact . Only in 2006 and 2010 have they been ranked inside the top fifteen in defense overall , and Payton has been the coach since 2006. Darrelle Revis is going to be missed in NY. No matter how many times Rex Ryan tries to boast about CB Antonio Cromartie, the Jets secondary is going to be different on the backend. If Darrelle Revis could stay healthy, he will really help the Bucs shake things up. If the Bucs have any chance of making it to the playoffs, you’re right, the team will need to get over the new Orleans Saints. Replied again. Let me know if you think my comment was succinct enough. After you check out the facts I stated , I believe your judgment will be different altogether ! That’s what’s different about the NFL than MLB or the NBA, Al. Team’s just don’t gut rosters. They either add or subtract building blocks piecemeal. More than any other league, the NFL is about winning and winning now. It’s far too difficult to construct a roster, and keep a fan base. Teams just don’t start over on a whim. And why would Payton need to do something about his defense when his offense is scoring 42 points a game? That’s exactly what everyone in the bay area is hoping for. Stay tuned. He’s gonna see some playing time tonight against the fish.